If you are a small business owner, you are always looking for inexpensive ways to simplify your job. You may have heard of Quickbooks Payroll by Intuit. Quickbooks Payroll is a software developed specifically for business owners like you. The software supposedly takes away the need for an account or payroll manager, saving you money. However, is it actually that simple? This post will highlight some of the advantages and disadvantages of using Quickbooks Payroll. If you would like to learn more before you decide for yourself, continue reading. Here are the top pros and cons of Quickbooks Payroll for small business owners. Across the board, people love the simplicity provided by Quickbooks Payroll, even when dealing with W-4 allowances. The service has been rated by many critics as one of the easiest software available. Quickbooks does all the tax calculations for you. All you have to do, is enter in your employees’ information and the sum they are getting paid. Intuit even provides an added feature that will simplify your job even further. If you choose to pay a little bit extra, you can have a Quickbooks Payroll specialist enter in all that information for you. Thus, saving you time and money. If you are looking for the payroll software that is easiest to use, Quickbooks Payroll is the way to go. While there are some software out there that provide additional features for employee retirement or healthcare benefits, Quickbooks is not one of them. They also do not have any features for HR support, which other software provide, as well. Remember though, all these extra features will of course come with a steeper price tag. If these features are necessary for your business, Intuit’s software is not the best choice. However, if you do not need all the extra bells and whistles, Quickbooks Payroll may be right for you. 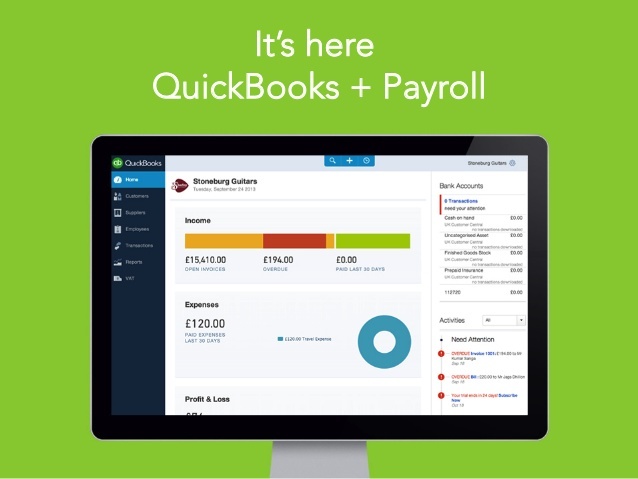 Another huge advantage provided by Quickbooks Payroll is the cost! There are two levels of service provided – enhanced and full service. However, both levels are definitely affordable for most. What is also even better about Intuit’s low costs? No hidden fees! You will never have to face that feeling of dread when you realize your monthly bill is higher than expected. That is valuable. Small business owners, like yourself, often do not have the extra capital to withstand those financial surprises. If you are a financially savvy business owner looking for the most cost-efficient payroll software out there, Quickbooks is the best choice for you. Intuit’s Quickbooks has been lauded as the best in the industry for small business owners, like yourself. However, the same does not seem to be true of Quickbooks Payroll. Many customers have filed complaints on numerous websites. The complaints regard all areas of operation, from customer service to software performance. Unfortunately, many of these complaints were filed as recently as May 2016. However, there is no doubt that Intuit will quickly respond to these complaints with a software update to fix the bugs. If you are willing to wait a couple months to ensure that these problems are worked out, Quickbooks Payroll may be worth the risk. In addition to the basic Quickbooks Payroll software, the company also offers a more comprehensive service with their Enhanced Payroll software. You can benefit from enhanced features with this premium service. In addition to all the same services offered by the basic level, Enhanced services gets you access to works’ compensation, labor law, family business tax, employee time tracking and compliance and tax law features. This definitely simplifies things for the busy business owner. Consider Quickbooks Enhanced Payroll by Intuit if the basic Payroll software is not enough for your needs. Business owners are busy people. Quickbooks Payroll provides a way to cut down on the time needed to pay your employees. The software provides an incredibly user-friendly interface for two low price options. Unfortunately, Intuit does not offer many extra service that some could find useful, such as HR support or retirement benefits. In addition, they have not received the best reviews from users like you recently. However, if you need an easy to use, affordable payroll software and are willing to wait out the reported software issues, Quickbooks Payroll is an excellent choice. If you use Quickbooks Payroll already, let us know how you like it in the comments below.